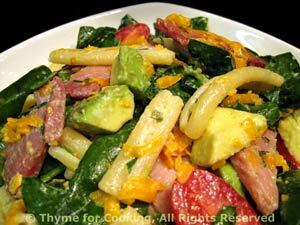 Easy Dinner from Thyme for Cooking: Spinach Salad with Ham, Avocado, Pasta. We're starting to see 'hot house' tomatoes... While I think the regular tomatoes lack flavor, the cherry tomatoes are usually quite nice. They will keep a week or longer, even on the kitchen counter.